German tyre firm Continental have spent the last year developing a radial tyre to fit common classic bike wheel sizes, with the aim of revolutionising the performance of older machines. On the basis of our first test, the new Classic Attack rubber looks set to transform the handling of countless old shonkers up and down the UK. 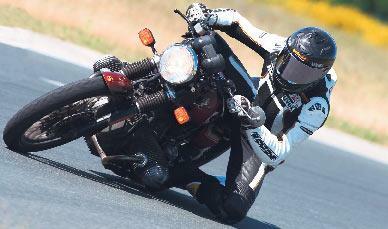 MCN test rider Bruce Dunn rode a 1981 BMW R100 fitted with Classic Attack rubber around Continental’s high-speed oval. He said: “The 30-year-old bike rode superbly. At an indicated 190kph (118mph) the BMW was tracking the chosen line exactly. "Through the banked turns it remained stable, on the straights I tried to induce a weave but this was damped out. I was impressed with the improved stability. "I have been riding for 25 years, and remember all too vividly the limitations of old cross-ply and bias-belted tyres. Thomas Zoller, Continental head of motorcycle R&D, explained the thinking behind the Classic Attack: “We wanted to expand our success from the Classic racing range, and create a road tyre that would improve the ride quality of classic machines.